Ideas to Inspire the Perfect Dream Office In Your Kitchen! Respond to emails, pay bills, sort mail, even get work done, all while family supper simmers nearby! You may be under the impression that you need a spare room or large space to set up a proper home office in your home. Not at all! The multi-functional kitchen, with all it takes on in a day –culinary and gathering hub – is actually the perfect place to incorporate a work- and organization- friendly space that is so very convenient and a pleasure to use. 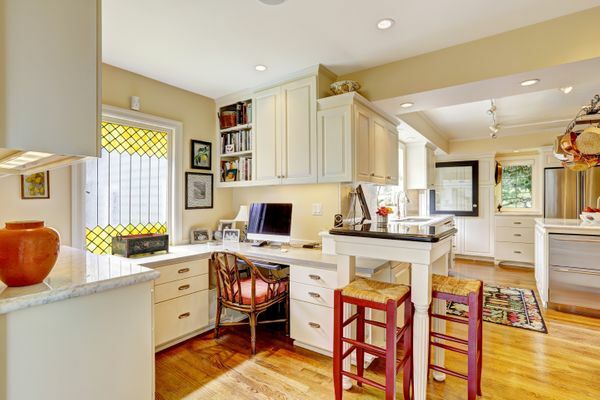 If you’ve been dreaming about the ideal home office, but are short on space, look no further than your kitchen. It’s amazing what can be done! Brilliant workspaces can be created with only a short stretch of countertop, a spare corner, or even inside an antique hutch. The first important step is identifying the best place for your kitchen work centre. It will likely be that space that is least- or under-used. An empty wall, an awkward corner, an empty stretch of countertop invite a tidy, convenient, and productive home office. 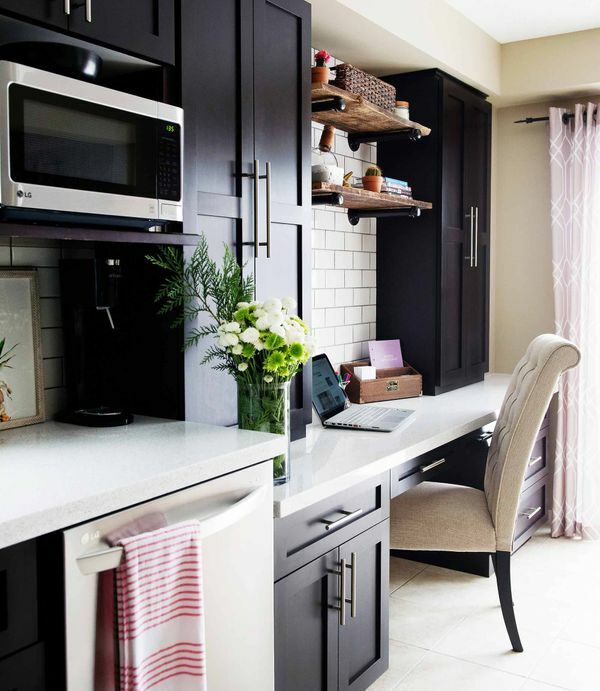 If you have a corner in your kitchen that seems under-utilized, this is the perfect place to incorporate a corner office unit that can function as a natural and efficient landing place for keys and mail. It’s also a space where all family members can sit comfortably and get their work done. 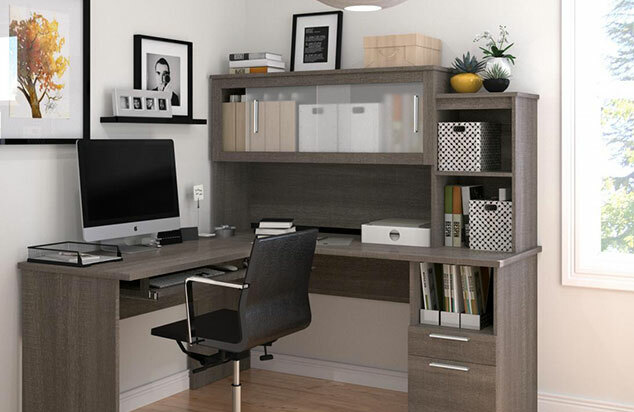 An L-shaped desk and storage combination is the perfect, compact solution to address the various demands of any home office. A desk extension at the end of a length of kitchen workspace keeps you close to the action, but not in the middle of it. Close, but not too close! A great place to do homework, pay bills or check email while being close enough to easily tend to cooking. It’s also extra counter space for staging in the event of a big dinner event or party as office supplies can quickly be stowed in the office drawers or cabinets. You may have a niche that might feel overloaded with cabinets – lucky you! This is a tremendous boon for storage, but it might end up more of a disorganized catch all, otherwise losing out on some great potential. It may be that your kitchen has some “lost space” – perhaps a nook that doesn’t have much of a purpose at all. 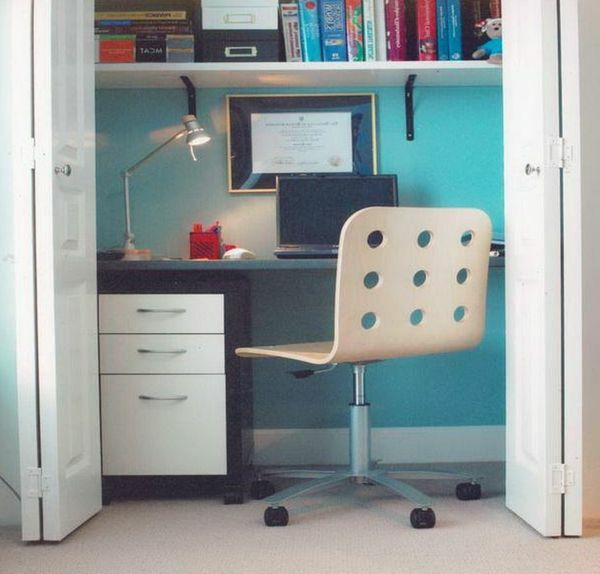 Regardless, put the space to more efficient use with a compact home-office design. 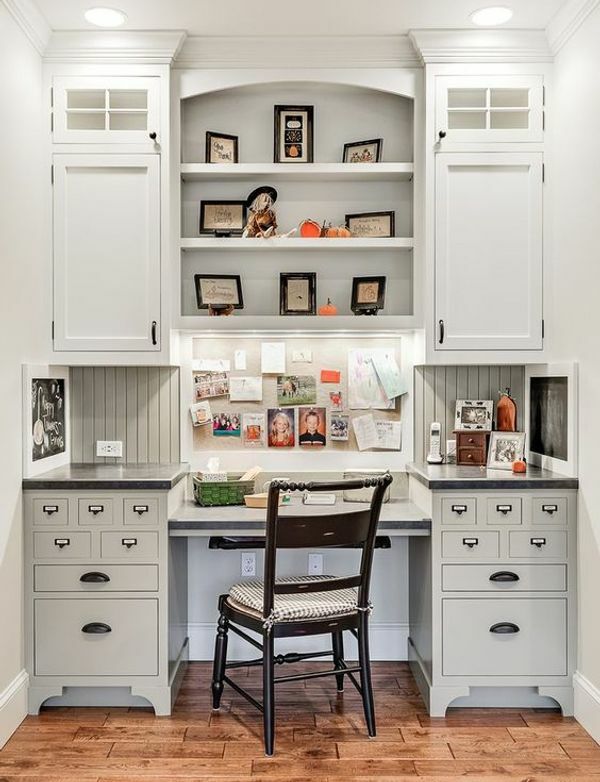 You can repurpose your existing cabinets to suit, or in the case of an under-utilized alcove, simply incorporate a desk that fits, add some shelving or cabinets mounted above. Voila! 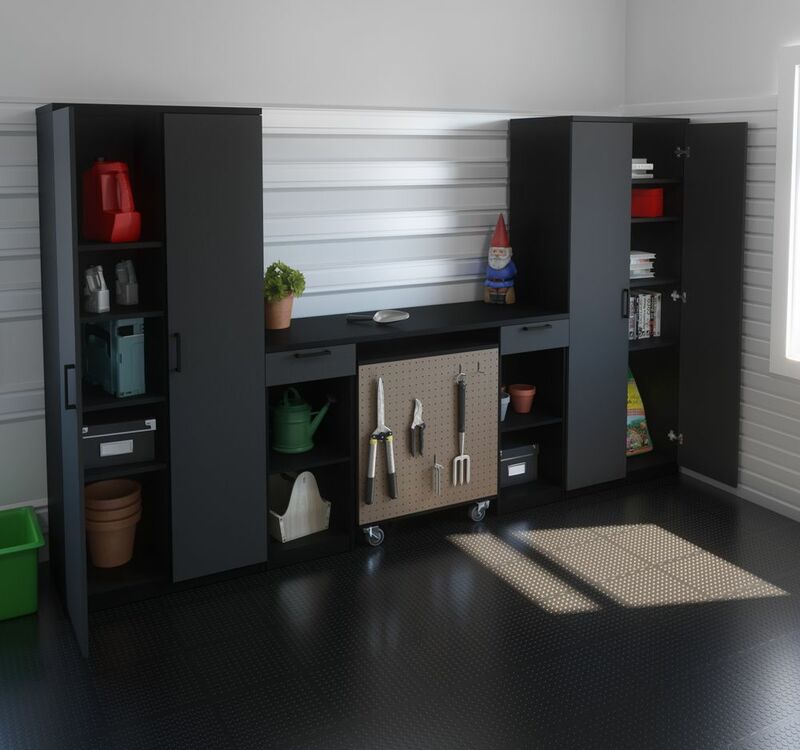 You’ve created a compact kitchen office with space for sorting bills and paperwork, getting work done and keeping documents organized. Don’t forget the wall! 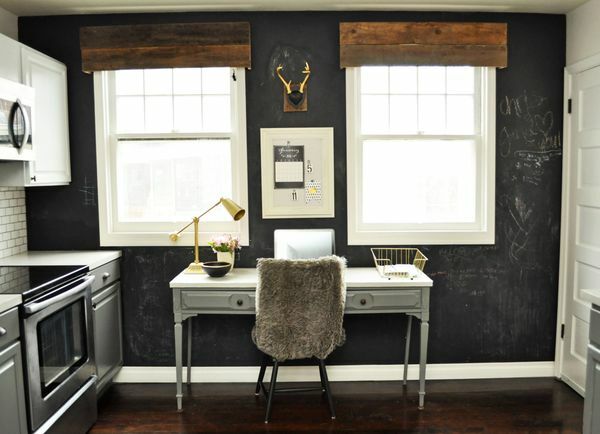 No matter the size of your work area, try a cork backsplash to pin calendar, memos and other important items, or, even more fun, a chalkboard on the wall behind it. This is a great way to keep the important things front of mind. 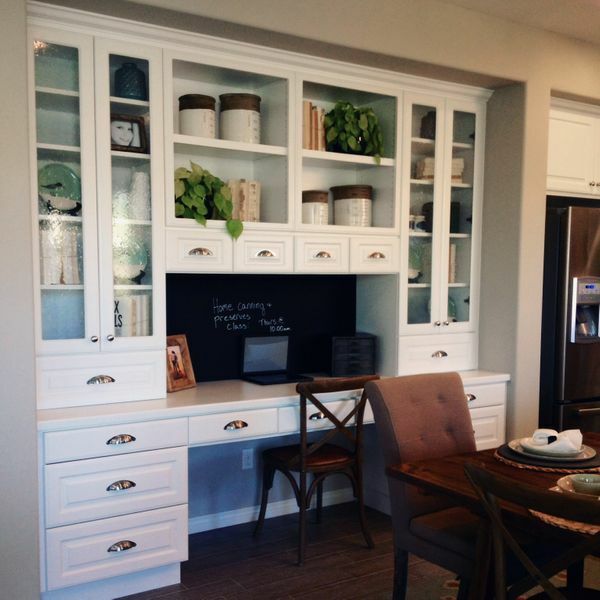 Remember that your kitchen office has the luxury of not having to completely conform to your kitchen design. Play with the drawer and door pulls to give more of an apothecary or vintage look such as above, or use finishing details such as graceful legs or perhaps a custom built desk to look more like heirloom furniture. This allows the office space to feel unique and separate rather than more of the same bank of kitchen cabinets. If kitchen room space is at a premium, perhaps look to a nearby closet to transform into your home’s organization hub. 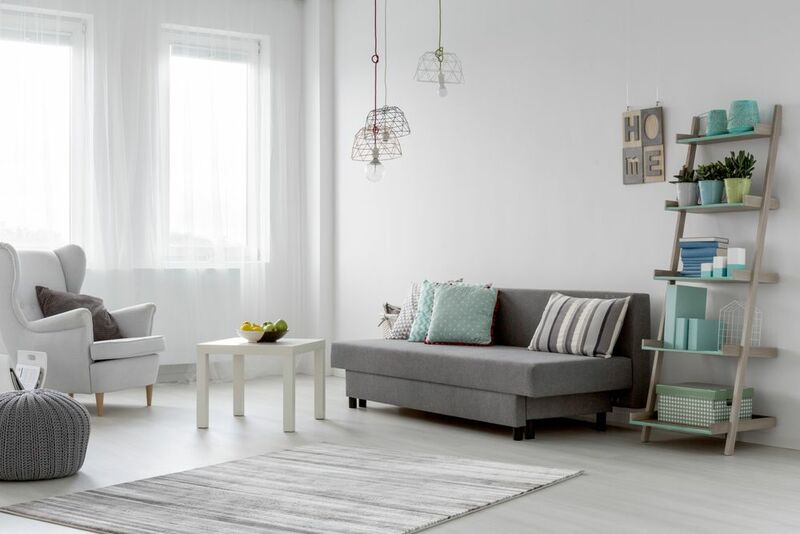 It’s the perfect place to include a small work space as well as plenty of storage in the way of open shelving and under desk units. If you’re looking for a cleaner profile with more permanence, incorporate upper cabinet units to keep your office supplies and other important items sorted. Expecting guests? Simply close your doors to keep the office out of view! Save surface work space by using pull out shelves for your printer and scanner. Lighting might be a challenge so consider space-saving under cabinet solutions to help illuminate your work area. Your kitchen island is great for storage. Dedicate a couple of drawers or cabinets on the non-kitchen side for more office storage. Create under-desk storage using square wicker baskets, pretty storage boxes and magazine racks. Creatively make use of old kitchen tools to keep organized. Store paper clips in old muffin tins or iced cube trays, or a wine rack for storing rolled up magazines or documents.